This was sent to us by several Las Pinas residents after some of them received a circular asking them to pick up their children from school. In a circular handed out by Bethany School to its parents and also published on their Facebook Page, it encouraged everyone to take necessary precautions to avoid having their children being kidnapped. 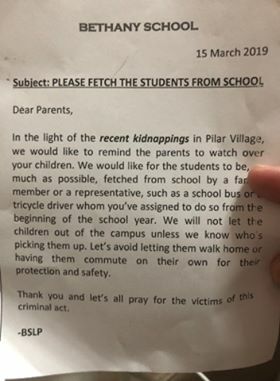 “In the light of recent kidnappings in Pilar Village, we would like to remind the parents to watch over your children,” said Bethany School in their advisory. They called on the parents to assign family members or school buses and trusted tricycle drivers to just pick up their children from the school as much as possible. “We will not let the children out of the campus unless we know who’s picking them up,” said school authorities, asking parents to not let their children walk home or commute on their own. We tried to search for news items about recent kidnappings in the city but could not find any. At any rate, please still do take extra precautions as we’ve seen several kidnapping attempts in nearby Paranaque City in the recent months. If you know of any such incidents, please let us know the details so we can warn everyone in the area. We tried messaging Bethany School officials via their Facebook Page but they haven’t replied yet.